On Friday, April 15th, 2016, posters defaming individuals involved with Students for Justice in Palestine (SJP), the Muslim Student Association (MSA), and campaigns for boycott, divestment and sanctions of Israel, more broadly were discovered at UCLA. Commissioned by conservative agitator David Horowitz and likely circulated by unknown individuals working in collaboration, similar posters have also been confirmed at UC Berkeley, UC Santa Barbara, and San Diego State University. While this is not the first time that Horowitz has circulated posters on university campuses attacking SJP and MSA, this latest round represents a serious escalation from Horowitz’s past efforts. In this most recent poster campaign, individual student and faculty names from each respective campus are prominently displayed beneath the charge of having “allied themselves with Palestinian terrorists to perpetrate BDS and Jew Hatred on campus” as a result of their supporting BDS and the broader Palestinian struggle for freedom and self-determination. In addition to student activists in MSA and SJP, Horowitz also attacked two Black professors at UCLA as well as Angela Davis, a prominent activist combatting all forms of oppression in the US and abroad and Black professor from UC Santa Cruz, for their support of Palestinian rights. This is hardly unexpected from Horowitz, who in addition to his attacks on Muslims, has a long history of attacking the Black community. In 2001, Horowitz took out ads in campus newspapers including the Daily Californian which claimed that Black Americans should be “grateful” for slavery. We in UAW 2865 condemn these posters as Islamophobic and racist fear-mongering tactics intended to chill and silence protected political speech. Though concerned by the woefully insufficient reaction of UC Berkeley administration as well as the complete lack of attention by officials at UC Santa Barbara, we are heartened by the swift administrative response from UCLA, whose Vice Chancellor for Equity, Diversity and Inclusion sent an email to the campus community denouncing the posters as intimidation and defending the integrity of SJP and MSA. Nevertheless, we hope that UC administrators will continue working to better implement SJP UCLA’s requests, which include a meeting between the Chancellor and Palestinian students on campus and training campus officials in recognizing, condemning and confronting Islamophobia and racism against people of Southwest Asian/North African background as they should any other form of institutional, ideological or interpersonal xenophobia and violence. We further hope that administrators on all other impacted campuses will take similar measures. Although UCLA administrators have worked to address the needs of students there, UCSB administrators have been silent thus far. And Berkeley officials, though aware of the strong statement released at UCLA, opted to stop short of offering the same level of support. Instead they released an anemic statement that failed to provide the campus community with adequate context in understanding why these posters are so inaccurate, offensive, and dangerous. Horowitz has had a long history of surveilling college students on their very own campuses and his tactics of slander, intimidation and bullying have been experienced by multiple generations of student organizers. Yet even as some administrators in the UC have been quick to repudiate Horowitz’s actions, it is clear that they did not occur in a vacuum. In May 2015, UC President and former Head of Homeland Security Janet Napolitano opined that the UC Regents should adopt the State Department Definition of anti-Semitism, which equates virtually any criticism of the state of Israel with anti-Semitism. In fact, the push for the UC Regents to adopt this definition was the result of years of effort by groups such as the AMCHA Initiative, the Zionist Organization of America, and the Brandeis Center to ensure that any and all speech that advocates for Palestinian freedom through BDS and other non-violent educational activities on UC campuses are equated with anti-Semitism. This latest attempt to stifle support for Palestinian rights developed from various previously unsuccessful pursuits of Title VI complaints, each of which was dismissed by the Department of Education, alleging that BDS and pro-Palestine speech deprived Jewish students of equal access to a quality education. The clamor for the State Department Definition was only the most recent phase of this broader push to slow the growth of the BDS movements on UC campuses, and AMCHA founder and UC Santa Cruz lecturer Tammi Rossman-Benjamin (who was caught on video espousing repugnantly Islamophobic generalizations about Palestinian and Palestine solidarity student activists) admitted that enforcement of the State Department Definition would stigmatize BDS as anti-Semitic. Despite the UC Regents’ claims to the contrary, the desire to abandon adoption of the State Department definition in favor of an ostensibly all-encompassing “Statement of Principles Against Intolerance” did not ultimately constitute a shift away from monitoring criticism of Israel on university campuses. This was made clear by the very selection of so-called “experts” who were to be consulted during the drafting process: all of them were men, one was a driving force for the racially exclusionary Proposition 209, and two are known to advocate for the suppression of speech critical of Israel. This panel represents a rather limited demographic of “experts” to weigh in on what is alleged to be an all-encompassing anti-oppression statement. Accordingly, the struggles of various communities were superficially coopted in a cheap attempt to legitimize the statement’s direct and false equation between anti-Semitism and anti-Zionism. Though the “Statement of Principles Against Intolerance” was ultimately amended before being passed to condemn instead “anti-Semitic forms of anti-Zionism,” and though it remains technically unenforceable on constitutional grounds, we condemn the process of drafting the “Statement of Principles” and find the finished product to be disastrously and offensively out of touch with the on-the-ground realities university students face today. Among other portions, this disconnect is evidenced by a section from the introductory “Contextual Statement” about Islamophobia. Despite the fact that the UC Regents repeatedly prided themselves on having drafted a statement that included Islamophobia at their March 23rd meeting, this language comes appallingly close to apologia for Islamophobia in centering not the reprehensibility of Islamophobia itself nor the danger to those directly impacted, but rather the “fear” of the general UC community, and implying a cyclical parity between vigilante violence and Islamophobic bigotry and aggression. Most distressingly, the statement’s conclusion that this “cycle” of attacks and Islamophobic “counter-attacks” “generate[s] policy positions or statements that are perceived to be personal attacks that reflect prejudice or intolerance based solely on religious belief” paints Islamophobia as a matter of misperception, rather than a dangerously escalating phenomenon. It also does not recognize that the culture wars taking place on University campuses are largely informed by, funded through and incited by the University of California’s ties to privatized business profiting from war and militarization in the South West Asia and North Africa (SWANA) region. The statement gives no mention to rhetorics of intolerance and bigotry in the current Presidential election or US policy and structural and institutional violations of civil liberties impacting Arab, Muslim and SWANA peoples in the US as being tied to the rise of Islamophobia. This is hardly the statement one would expect in response to a domestic climate in which politicians and public figures have seriously proposed interment for Muslims in the U.S.; when leading presidential candidates campaign on banning Muslims from entering the U.S. and glorify Islamophobic violence; when half of polled American voters support this proposed Muslim ban; when individuals are assaulted simply for speaking Arabic or wearing hijab in public;when Muslims (and those perceived to be Muslim) are removed from flights without explanation,, or for speaking Arabic, as recently befell a UC Berkeley student of Iraqi origin; when Islamophobic sentiment in the U.S. is so pronounced that the Department of Education feels compelled to issue an open letter warning educators to be vigilant about the climate for Muslim students. These toxic attitudes have also entered U.S. policy, evidenced by a law signed last December that subjects European citizens of Iranian, Iraqi, Syrian, and Sudanese descent to discriminatory screening and visa barriers to travel to the U.S. This law risks making U.S. citizens with national origins from those same countries into second-class citizens by causing the E.U. to reciprocate and subject them to visa discrimination as well. Even after the “Statement of Principles Against Intolerance” was passed, the UC Regents attempted to use their authority to intimidate the American Association of Anthropologists into voting against an academic boycott of Israeli institutions with a proven track record of perpetuating the occupation, discriminating against and denying Palestinians the very right to academic freedom on which the Regents claim to base their opposition, showing where their true priorities lie. The statement’s take on other forms of racism and xenophobia, which are cheaply consolidated into a single paragraph and reduced to a matter of differences in “debates” on university campuses, is equally abysmal. Racism is transformed from a systemic issue to a matter of insensitive discourse, which is convenient given that it was the UC Regents who helped introduce structural inequality to the UC system by laying the groundwork for what would become proposition 209, which effectively decimated the enrollment rate and statistical and physical presence of students of color on UC campuses. Transmuting racism from a systemic issue to a matter of personal worldview and speech allows the UC Regents to deflect responsibility and complicity for the structural inequalities still inherent to the UC from both themselves as well as the administrators on each campus tasked with responding to student needs. There is no denying that Horowitz’s posters are defamatory, racist, and Islamophobic. But when the UC Regents continue to prioritize the monitoring of discourse related to Palestine/Israel over acknowledging the clearly escalating levels of Islamophobia and racism on the national front, or when administrators on UC campuses remain glaringly uninformed about Islamophobia and racism, they are complicit in creating the very environment that leads to Horowitz’s incitement as well as the incident currently being investigated as a hate crime at UC Riverside. Make no mistake, it is the repeated ignoring and delegitimization of Islamophobia, racism, and complicity in the routine suppression of pro-Palestine speech and activity on university campuses that allowed for the sort of escalation we have seen from David Horowitz and his followers, whose actions epitomize the often ignored intersection of Islamophobia, racism, and the demonization of pro-Palestine sentiment. Whatever our demographic and/or political beliefs, all of us–students, faculty, and campus workers–deserve equal protection and an educational environment free from harassment and intimidation. But absent a genuine comprehension of the racism and harassment most directly affecting university students today, such a goal will be nothing more than a pipe dream to which UC officials can pretend to pay lip service through the denunciation of someone like Horowitz, who in fact is only capitalizing on an atmosphere that UC Regents and administrators have aided and abetted. The full text and PDF of this statement, including relevant citations, can be found here. 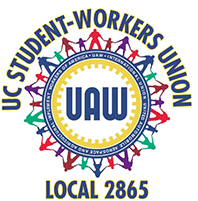 This entry was posted in Academic Freedom, Free Speech, Islamophobia, U.S. Labor News, UAW, UAW 2865. Bookmark the permalink.